Don’t wait for your manager or organisation to engage you – take ownership and start to improve your personal Employee Engagement levels now. 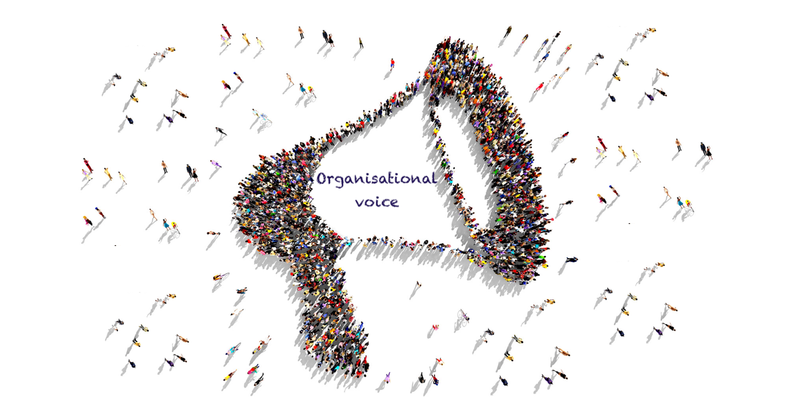 Many things can influence whether or not we are fully engaged – changes in the organisation (particularly a change in/by a direct supervisor), our situation at home, the behaviour of our colleagues, challenging project changes and even world events. We can’t stay fully engaged without putting in a little effort. Engagement is also not an all-or-nothing proposition, but is more like a dance with both partners needing to pay attention and “show up”. Engagement isn’t static or only from the top down. 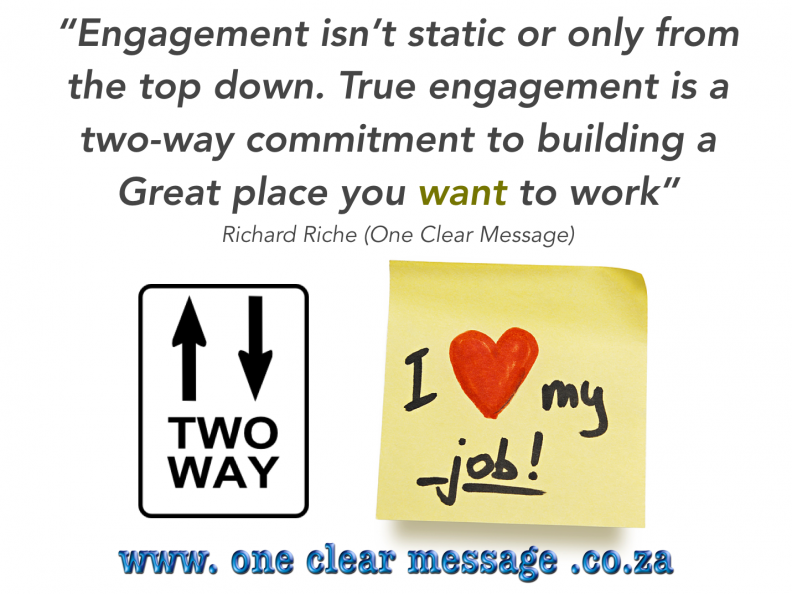 True engagement is a two-way commitment to building a “Great place you want to work“. It is sometimes tempting to blame those around us for our troubles (management, co-workers and even our partners), insisting we have no power to change things, claiming we must wait for those in power to make a change to poor practices. Unfortunately this approach leaves us feeling powerless and stuck. Nobody can maintain full engagement 100% of the time on their own. It helps to work in a supportive engaged environment, but ultimately nobody else can make us more engaged. It is a lot like motivation – our organisations can build an environment that makes it easier to stay motivated, but on a practical our motivation (or engagement) is part of our own unique personal life equation. Our Personal Employee Engagement levels reflect our own relationship with work based on our personal values, talents and aspirations. It is reasonable to expect senior leaders to build and sustain an inclusive, supportive and trust-rich workplace to help support our personal engagement. It certainly makes it easier when they are crystal clear about what the organisation’s purpose, values, and strategy are and how each of us fit into that big picture. It’s reasonable to expect them to fix policies and practices that reduces engagement and high performance. The bottom line is that we too have a key part to play in building an Engaged Workplace. 1. Discover what matters to you (what makes your eyes light up). When we aren’t clear on our own aspirations and motivators, we can’t really satisfy them at work. We can’t find meaning even if our employer has a compelling mission, if we have no idea about what inspires us. When our personal actions are not aligned with what we believe it is easier to be miserable before we even walk through the office door. If we align our values with the work we do they can be a powerful fuel for great days at work. 2. Know what matters to your organisation. To be fully engaged we need to be good at what we do (feel what we do makes a difference). We can’t exceed expectations or a high level of achievement if we don’t know what the organisation needs from us (and why). Market expectations, conditions and strategies can change rapidly, so checking in often with our managers to clarify expectations helps clarify what, how and why. Use these touch base sessions to recalibrate and focus your energy and talents on the top agreed priorities on your very long list of to-dos. 3. Build on your strengths with feedback. 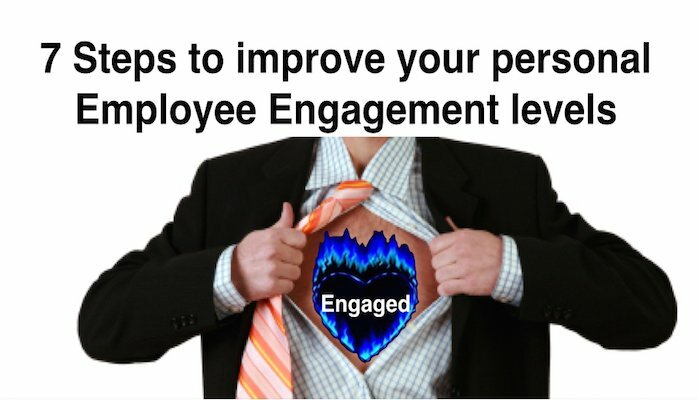 A key to building our personal Employee Engagement levels is the need to address more than our development needs. Uncovering what we do well is often best achieved by asking for feedback (in addition to self-assessment). All of us have blind spots (things about ourselves we cannot see) feedback helps us discover these strengths as well as areas to improve. Feedback is not just about what needs to be improved it can also highlight areas we are doing well and could augment. Once we are aware of these areas of strength, we can work on getting even better results. Find opportunities to apply those talents in different areas of your life – not just work. Applying strengths in non-work areas helps us gain deeper understanding of the process and increases our skills set further. Yes work on any weaknesses that is career limiting too, but pick one area of development at a time (we can’t change everything in one shot). Average work is not an ingredient of full engagement. Full engagement comes from mastery and meaning. 4. Commit to the long haul or quit. Choose to be part of the team. Choose to develop mastery. Choose to discover the meaning in the work you do. Choose to take care of your health so you can have the energy to dive into your workweek and on the weekend. Choose to connect emotionally and build healthy relationships. Choose to utilise your strengths to produce your best work. Choose to ask for help from your manager (or team members) to increase your engagement and effectiveness as part of the team. Being committed means being willing to do what it takes to get results (and sticking to it even when the going gets tough). Being part of a team means getting involved in what is asked of you, even if it isn’t in your immediate job description. Engagement involves commitment, are you in and part of the solution or out? 5. Build resilience. 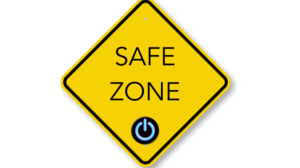 Do you fall to pieces every time you hit a speed bump on your journey? Do you give up at the first sign of trouble? We can sometimes feel overwhelmed with the chaos of life but quitting too soon helps increase our feelings of powerlessness and helplessness. Imagine you’d quit when you hit obstacles as you were learning to walk? (have you ever watched kids learning to walk? they fall down, get up, fall down – they are resilient and driven by their desire to learn). Focus your desire to learn and grow, make an effort to bounce back quickly from setbacks by remembering why you are doing it. When we commit, push on no matter what speed bumps we encounter and we often realise we are stronger and more capable than we thought. 6. Take ownership of your contribution. Taking full ownership of our actions and the results they produce enables us to gain perspective and become part of the solution. Recognise the positive aspects of what you contribute in all areas of your life (at home, at work and socially), be open to receiving feedback on areas of improvement as well as areas of strength. View this feedback and perspective as discovering the stepping-stones to getting better at what we do and, ultimately, happier in life. When we can own up to improvements that need to be made and honour them, the pain and blame reduce and we can make a bigger impact. 7. 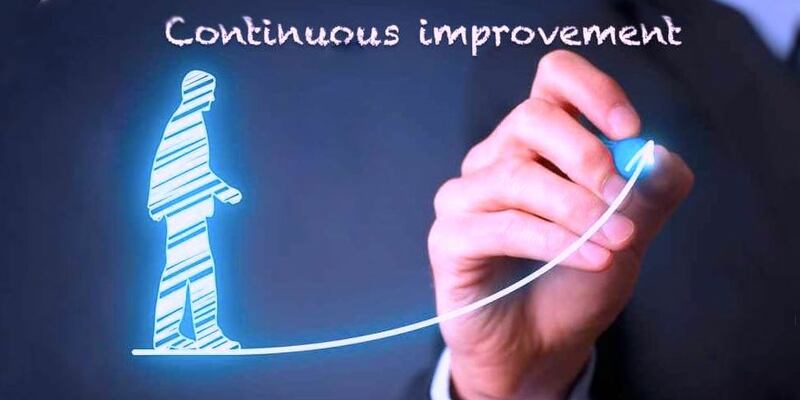 Strive for continuous learning. Making mistakes is never fun, but learning can be fun. Learning is a mindset which says it is okay to make mistakes on the journey to success. Having a fixed mindset which holds that we either fail or succeed means we hardly ever learn (or try anything new) for fear of failure. As we develop the accountable/growth mindset we start to see these “failures” as teachable moments that will help make us better and more successful in the future. Resist the urge to assign blame to outside forces and, instead, use what you’ve learned to learn and grow. We spend thousands of hours each year at work; make them count. Work dissatisfaction always spills over into our personal life if we don’t take action. What are you waiting for? 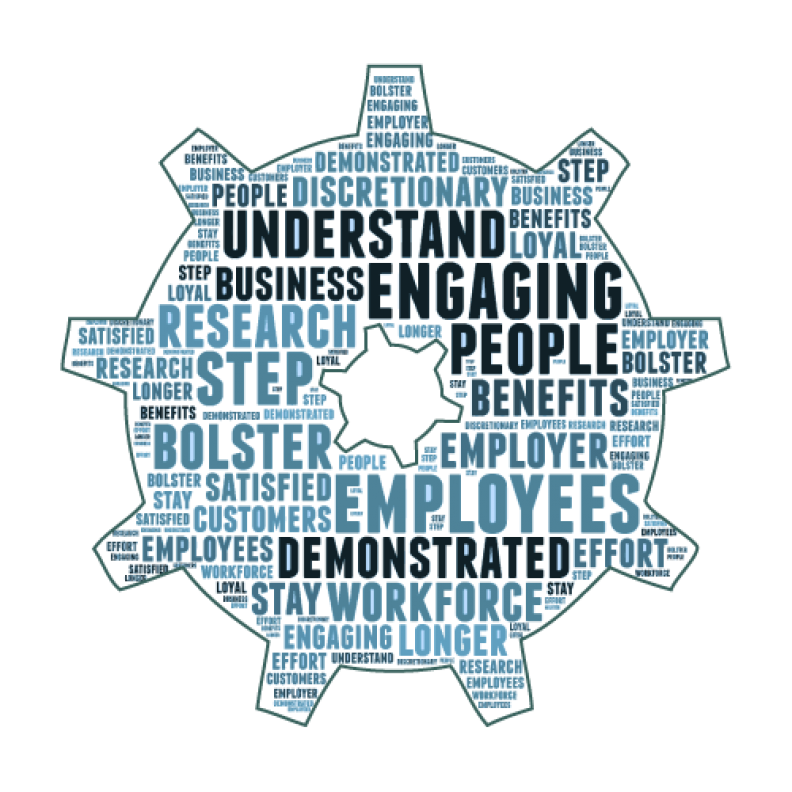 Choose to be part of the solution and build your personal Employee Engagement levels today.